Rotary time and date stamps are offered in two models - 12 hour or 24 hour. Settings are changed by turning the bands to the desired date and rotating the base to the desired time. Impression is 2" diameter. 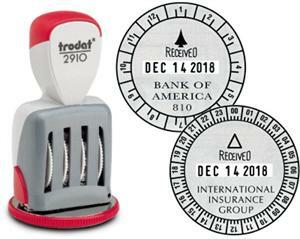 The stamps have an arrow pointed up to designate the time. To change the time just rotate the hour wheel. A positive "click" locking system prevents accidental adjustments. 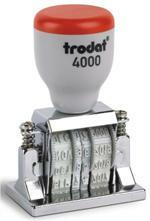 The large hour adjustment wheel prevents the user's fingers from contacting the inked surface of the printing die. Customize by making a rubber or polymer die with your customer's desired copy and simply attach it to the die plate. 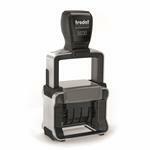 Add Years of Life to an Old Stamp!